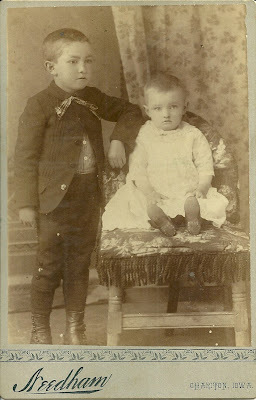 Cabinet photo of brothers Otis Ted and Harley Fayette Niswender of Norwood, Iowa; taken by the Needham studio of Chariton, Iowa. I'm slowly working my way through the collection. It may turn out that some of the people are related. Otis Ted Niswender was born 27 August 1883 in Iowa; he died in 1965 in Chariton, Iowa. 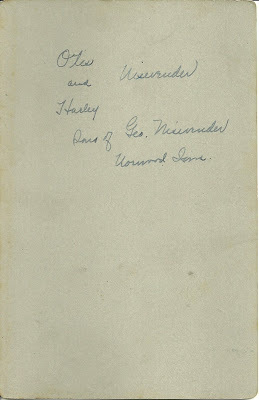 Brother Harley Fayette Niswender was born 13 July 1887 in Lucas, Iowa; he died in 1961 in Gillette, Wyoming. They were the sons of George Harris Niswender and his wife Laura Ann (Douglass) Niswender, both born and raised in Iowa. Their paternal grandparents were Samuel Niswender, born in Pennsylvania, and his wife Eliza (Kohn) Niswender, born in Virginia. They both died in Iowa. The Niswender name appears to have evolved from Neuschwender. The brothers' maternal grandparents were Noble Douglass and his wife Louisa (Bales) Douglass, both born in Indiana. They both died at Chariton, Iowa. Otis Ted Niswender married Velma Nell Arnold, born 1 August 1886 in Lucas, Iowa, the daughter of Abraham Lincoln Arnold and his wife Anna (Bond) Arnold. Her father was born in Iowa; her mother, in Pennsylvania; both died in Lucas, Iowa. Otis Ted and Velma Nell (Arnold) Niswender raised a family of several sons and daughters. 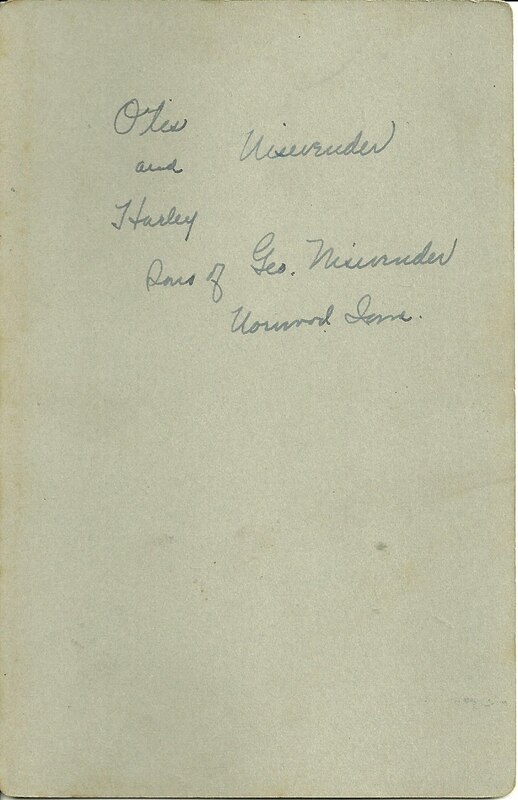 In 1905 Harley Fayette Niswender married Alice Cozetta Scott, who was born 17 Jun 1886 in Decatur City, Iowa, the daughter of Charles Calvin Scott and his wife Rachel Ann (Trembly) Scott, both of Iowa. Harley and Alice raised a large family. If you have corrections, additions or insights regarding the information presented above, please scroll down to the bottom of the page to the comments box or contact me directly. Thanks for stopping by!